Introduction: Osgood-Schlatter disease (OSD) is a well known condition, characterized by pain over the tibial tubercle with subsequent tubercle prominence. Avulsion fracture following OSD is a rare complication. We report an unusual case of simultaneous bilateral tibial tubercle avulsion fracture in a 16 year old boy who was a known case of OSD. Case presentation: A 16 year old boy a known case of OSD presented to the outpatient department with history of jumping from the school compound wall (two feet height) while playing, followed by severe pain around anterior aspect of both knees and difficulty in walking. 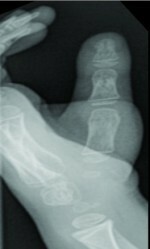 Radiographs showed bilateral tibial tubercle avulsion fracture. He was treated successfully with open reduction and internal fixation with tension band wiring. At the end of 22 months the patient was symptomatically relieved and both the tuberosities were united with the main bone. Conclusion: Even though bilateral Osgood-Schlatter disease (OSD) is a well known condition, one should always keep in mind the risk of tibial tubercle avulsion fractures while treating a case of OSD. Patient should be advised not to involve in strenuous activities till the disease subsides radiologically or till skeletal maturity. Keywords:Osgood-Schlatter disease (OSD); avulsion of tibial tubercle; traction apophysitis; tibial tubercle fracture.